There is no need to pull punches: Gennady Golovkin (37-0-1, 33 knockouts) middleweight title defense against Vanes “the Nightmare” Martirosyan (36-3-1, 21 knockouts) is not likely to become a fight of the year candidate. Martirosyan's most notable victories are not exactly over a murderer’s row of boxers, e.g., Ishe Smith and Kassim Ouma. As has been endlessly repeated, Martirosyan has not tussled in two years and when he did last fight, he dropped a unanimous decision to Erislandy Lara. To make matters more one-sided, for the first time the Armenian born boxer will be coming up from super-welterweight to the 160 pound division. Is there really a chance that “The Nightmare” could become GGG’s nightmare? Stranger things have happened in the squared circle. Witness Buster Douglas’s 1990 epic knockout upset of Mike Tyson, or sticking to the middies, how about Randy Turpin’s 1951 toppling of the greatest boxer of all-time, Sugar Ray Robinson? While I believe Canelo won the lottery with the draw in his 2017 duel with Golovkin, the Mexican master of the counter-punch was able to plant his share of solid right hands and body blows. Vanes possesses a snaky quick right, though he sometimes reaches with it, which could make for nighty-night left hook counter from Gennady. Asked how he reacted to the mega-fight being counted out, Golovkin commented, "We continued to work as if we were fighting an elite fighter on May 5th. We waited patiently for Tom Loeffler to tell us who it was, but we never stopped training hard and focused on a tough opponent." The truth, of course, is that GGG almost never stops training, perhaps even to the point of being over-trained. Ring Magazine hails GGG as the pound for pound best. But even the best can get better. I asked Gennady’s trainer, Abel Sanchez, to point out one aspect of his charge’s gloved game that could stand some tweaking. Half-teasing, Sanchez replied, "His English, I would like for GGG to be able to express himself better, but really everything, we work on, all aspects of a fight, mental, physical and technical. We never stand still. We are always trying to improve and evolve." But the boxing guru ducked my request to be more specific. So let me try. Maybe Gennady is tempting his foes to get closer, but great as he is, I think GGG could move his head a little more and be a mite more elusive. 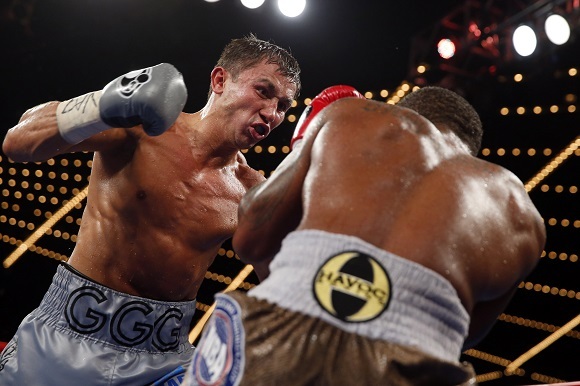 Yes, he has a steel girder for a chin, but GGG gets tagged with right hands. Also, against Canelo he seemed to take his foot off the pedal at the end of rounds, making it all the more easy for blind judges with short memories to rob him. The Canelo fight hitting the canvas and the groaning among boxing pundits about his opponent could put a barbell on GGG’s shoulders. For whatever reason, he seemed like he was stale or pressing in the first frames of the Canelo contest. I doubt it, but the pressure that GGG might put on himself to score a knockout could conceivably disrupt his violent art on Saturday night. Asked about the new opponent, Sanchez said that Martiorsyan is “different but the same. Fighters at the top are all skilled and well-schooled. Our job is to dominate, dictate and to make them adapt to what we want in front of us. Vanes is taller, longer, he is promising a war.” Sanchez finished saying, “so was Canelo until he was in the ring with GGG."